Marsh & Long Surveying, Inc. has been a successful land surveying and planning firm dating back to the 1930’s, focusing on residential and commercial land surveying. Marsh & Long Surveying, Inc. has the flexibility to mobilize multiple field crews to any one project at a moment’s notice. Using the latest surveying equipment and technology, we can complete large scale projects with extremely tight schedules on time and within budget. Although Marsh & Long Surveying, Inc.’s primary focus is on land surveying / planning and construction surveying, we also engage a network of very experienced engineering firms for projects requiring engineering designs, we also work hand and hand with wetland biologists and soil scientists as well as local quality control testing companies servicing the building construction industry. Marsh & Long Surveying, Inc. is extremely flexible, can revise schedules at a moment’s notice and reduce project turnaround time. We strive to keep our overhead low and maintain our competitive rates. With multiple surveyors, expert AUTOCAD technicians, and highly experienced field technicians, Marsh & Long Surveying, Inc. is setting a new standard for the surveying industry. 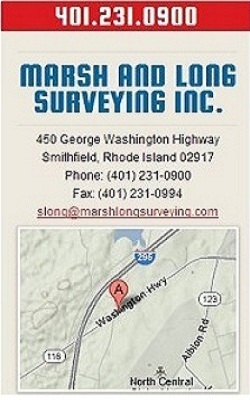 Marsh & Long Surveying, Inc. provides Residential, Commercial, Industrial, Environmental, and GPS Land Surveying services to the general public, private companies and municipalities in all of Rhode Island.